Written by chris maroulakos on Monday, June 28th, 2010 at 10:00am. 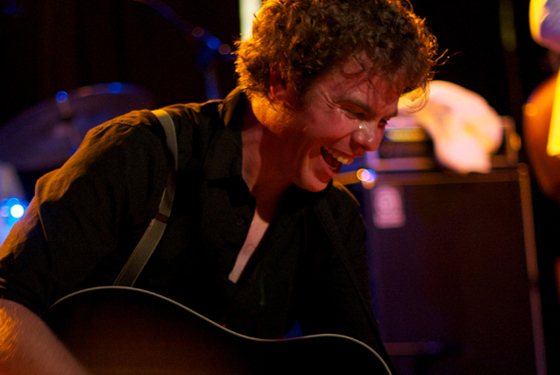 Josh Ritter is an anachronism. With his suspenders and curly head of red, newsboy hair, he could be a turn-of-the-century busker or a character out of a Dickens novel. His minimalist, acoustic folk albums fit snugly alongside 1960s Bob Dylan and 1930s Woody Guthrie. But the thing that most sets Ritter apart from modern-day musicians isn’t his wardrobe or his music. It’s his smile. Fans at the Belly Up Tavern were treated to over two hours of music by Ritter on Tuesday night, and his ear-to-ear grin didn’t disappear once. Supported by his four-piece band, he hopped around the stage with boundless exuberance. The audience seemed familiar with every corner of his expansive discography, singing along to nearly all of the epic set’s thirty songs. Their enthusiasm only added to Ritter’s energy, and he shared stories and jokes with the crowd as if the show were a reunion with old friends. Ritter began the set with songs from his majestic new album, So Runs the World Away. The finger-picked chords of “Change of Time” spiraled upward as the band carefully added layers to Ritter’s guitar and vocals. The Nick Cave-esque “Rattling Locks” punctuated its tale of haunted seclusion with a flurry of clicked sticks and ominous, distorted guitar. Every song told its own story, touching upon Ritter’s pet themes of dreams, religion, and love. His narratives were moving and insightful, but soaked in a wry humor that kept them from veering off into melancholy. With each song, Ritter led the crowd further along an emotional journey. He followed the morbid, retooled traditional “Folk Bloodbath” with the rousing “Good Man,” a gin-joint romp that turned every attendee into a backup singer. Bob Dylan is Ritter’s most obvious influence, but there were also shades of Paul Simon (“Lark”) and Cat Stevens (“Long Shadows”). He even paid tribute to the Boss with a cover of Springsteen’s “The River,” a nostalgic ode to depleted love that provided the night with one of its many highlights. Ritter has been playing some of these songs for years, but you would never know it by watching him. Whether grooving to the poppy “Right Moves” or closing the set with a singalong of “Wait For Love (You Know You Will),” Ritter radiated enthusiasm, the result of his unmistakable love for playing music. His unwavering smile remained plastered to his face even in between songs, such as when he praised Solana Beach for their “prevalence of dog bakeries.” But the real pleasure that night came from watching Josh Ritter play. It was the joy you feel watching someone do exactly what they were born to do. I had such a great time at this show. Great meeting you and thanks for sharing your photos. This was my third full Josh Ritter show and I enjoyed every minute of it! I'm really dissapointed I didn't attend, sounds like an amazing time.